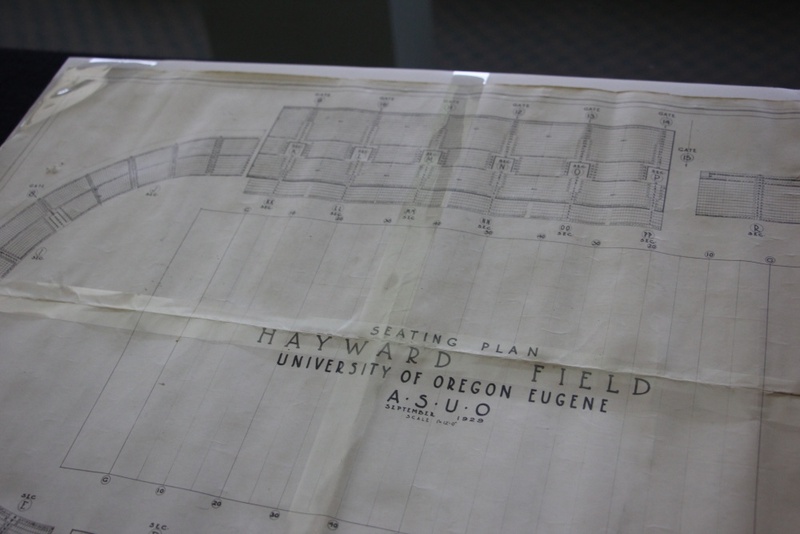 Go to Knight Library soon and you can see the letter that forever altered the trajectory of the University of Oregon track and field program, the letter that laid the groundwork for what would become Tracktown USA. It’s from Virgil Earl, who might be the most underappreciated person in UO track history, to then-university President Prince Lucien Campbell. 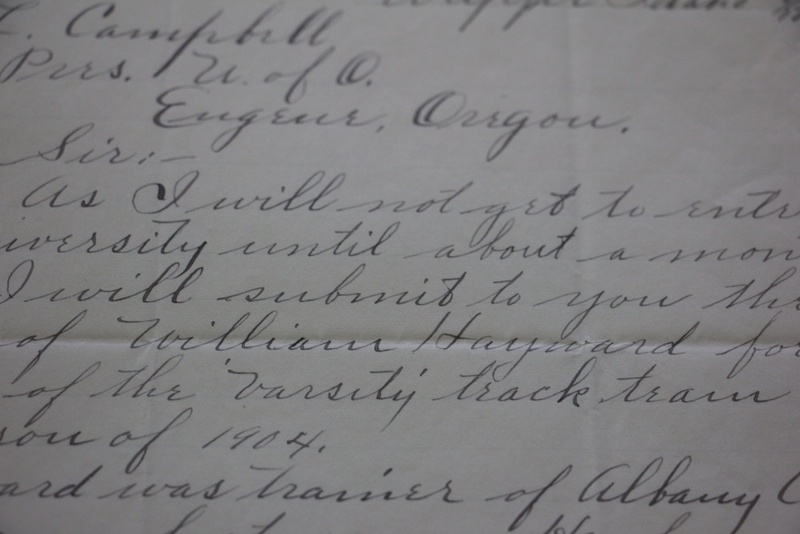 Earl was the student manager of the UO track and field team, and on Sept. 17, 1903, he penned his pivotal letter to Campbell. The favored and confident Ducks had recently suffered a shocking defeat to Albany College, and the manager of Albany’s team impressed Earl immensely. So Earl told Campbell that the UO should hire the architect behind Albany’s successful program, a fellow by the name of Bill Hayward. 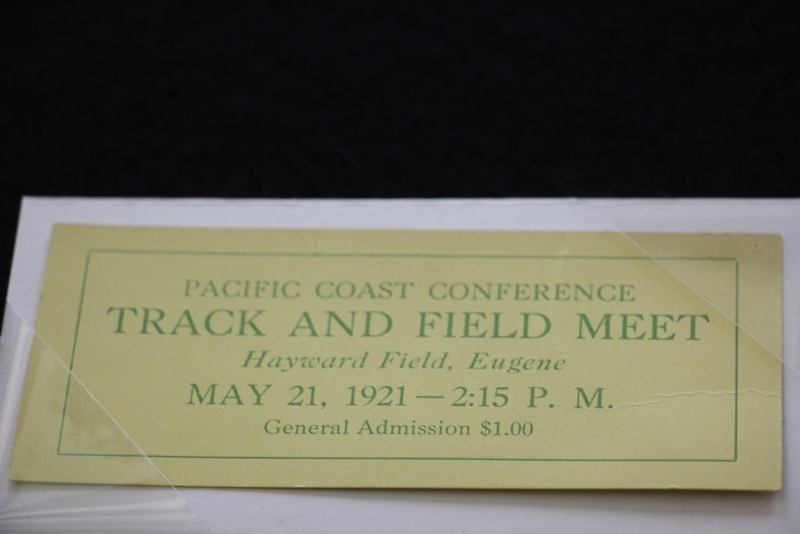 The letter, along with roughly 40 other documents and artifacts that chronicle the history of UO track and field, is now on display as part of “Oregon Spirit: The legacy of track and field,” at Knight Library’s Special Collections and University Archives Paulson Reading Room. 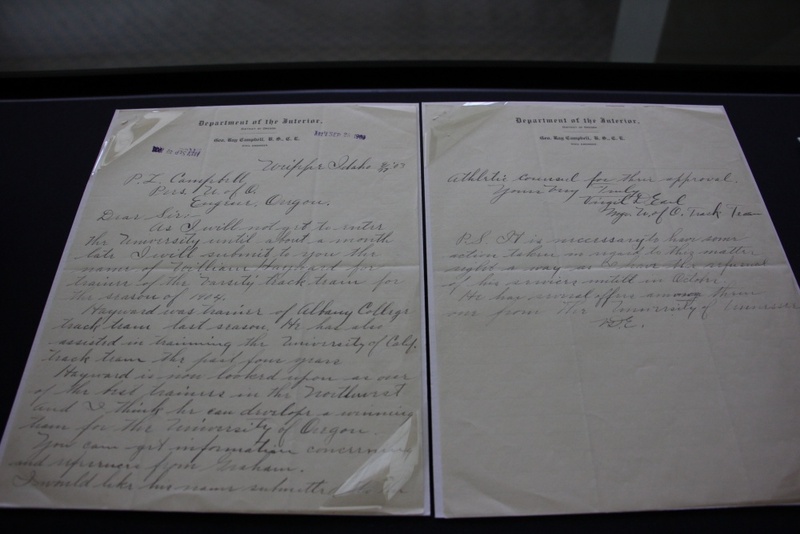 Goss curated the exhibit and uncovered the letter during the course of her exhaustive research. 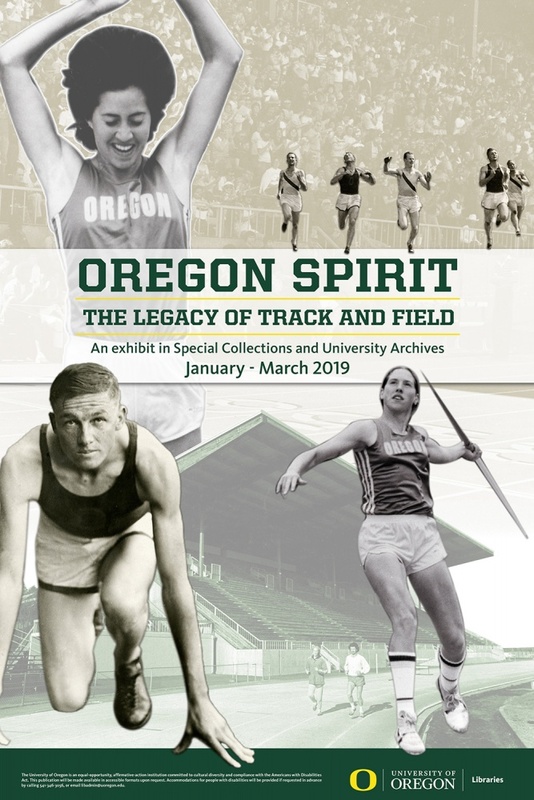 “Oregon Spirit” draws from 20 collections in the university archives — book collections, personal papers of athletes and coaches, administrative records — and focuses on the first 100 years of the program that cemented the connection between the sport and the university. “I think there’s a very strong narrative associated with track and field and specific people, and I am trying to focus on things that broaden that story so that it isn’t just people you’d expect to see,” said Goss of her approach. That includes the pre-Hayward history. The Ducks had a team in place starting in 1895, and they were a force statewide. Soon after his arrival on campus in 1904, however, Hayward lifted the school’s profile like a pole vaulter’s ascent and was named to lead the U.S. Olympic team in 1912. 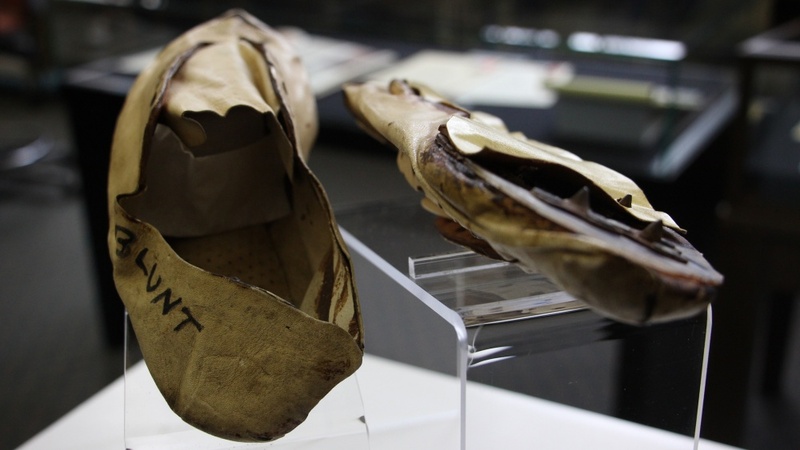 The exhibit includes a pair of shoes Bill Bowerman hand made for a sprinter named Dave Blunt in 1963. Ultra-thin leather is stitched and glued together, and a wax paper helps protect most of the shoe’s sole. They hardly resemble the high-tech shoes Duck sprinters wear today. “Oregon Spirit” also captures the evolution and rise of the women’s track and field team. 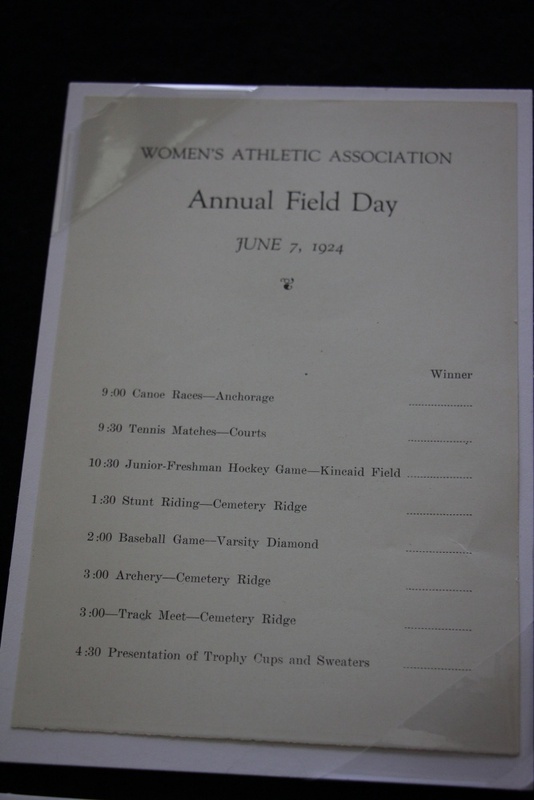 Programs for women-specific meets from 1916 and 1924 show the UO held meets that were open to other schools a century ago. Then flash forward to a 1965 report on the “women’s track and field interest group” and another from 1970 that marks the transition to an official women’s team. 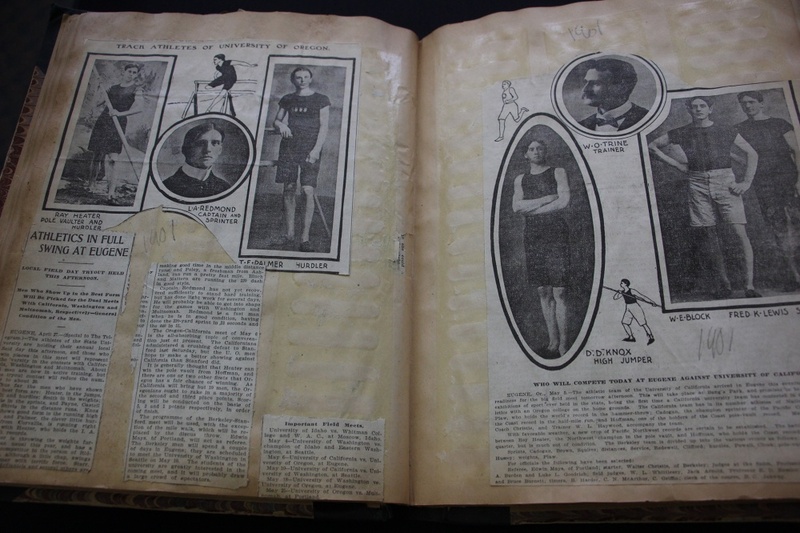 The oldest item on display is a scrapbook compiled by Clifton McArthur, the namesake of McArthur Court. Some of Bowerman’s personal notebooks are on display. In one, he’s philosophizing on what his most satisfying experience is. In another, he’s devised a workout for one of his star athletes prepping for the 1956 Olympics: future UO coach Bill Dellinger. A video monitor adjacent to the exhibit runs a loop of highlights dating back to the 1920s compiled by librarian Elizabeth Peterson. The video can also be found on the library’s YouTube channel. It includes a snippet of a previously undiscovered interview with Hayward just weeks prior to his death in 1947. For Goss, a UO alum and fan of Duck sports, the project was arduous and extremely gratifying all at once. “Putting it all together, you learn more about the history, and appreciate the heritage and legacy even more by pulling out these individual pieces and putting them in relation to each other,” she said. The exhibit is open Monday through Friday from 10 a.m. to 4 p.m. It will be on display through March 22.